It formed 4.6 billion years ago from the collapse of a giant molecular cloud. 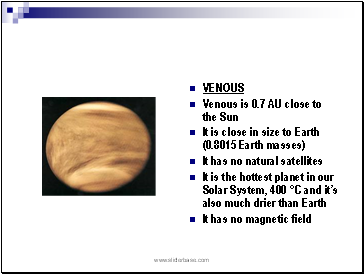 The vast majority of the system's mass is in the Sun, with most of the remaining mass contained in Jupiter. 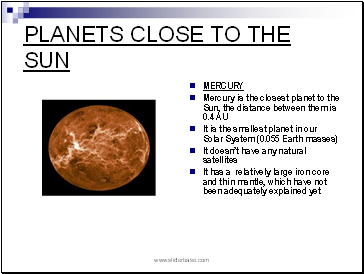 The four smaller inner planets, Mercury, Venus, Earth and Mars, also called the terrestrial planets, are primarily composed of rock and metal. 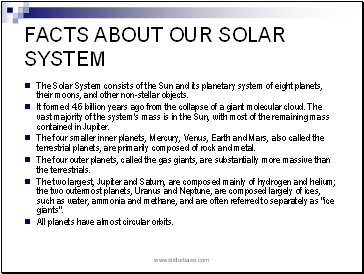 The two largest, Jupiter and Saturn, are composed mainly of hydrogen and helium; the two outermost planets, Uranus and Neptune, are composed largely of ices, such as water, ammonia and methane, and are often referred to separately as "ice giants". 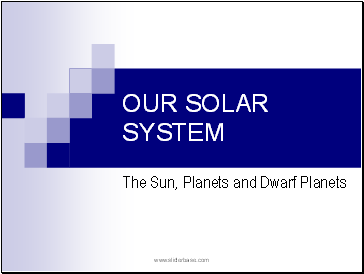 All planets have almost circular orbits. Evidence suggests that the Sun's position on the main sequence puts it in the "prime of life" for a star, in that it has not yet exhausted its store of hydrogen for nuclear fusion. The Sun is growing brighter; early in its history it was 70 percent as bright as it is today. 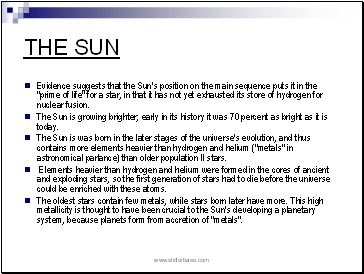 The Sun is was born in the later stages of the universe's evolution, and thus contains more elements heavier than hydrogen and helium ("metals" in astronomical parlance) than older population II stars. Elements heavier than hydrogen and helium were formed in the cores of ancient and exploding stars, so the first generation of stars had to die before the universe could be enriched with these atoms. The oldest stars contain few metals, while stars born later have more. This high metallicity is thought to have been crucial to the Sun's developing a planetary system, because planets form from accretion of "metals".